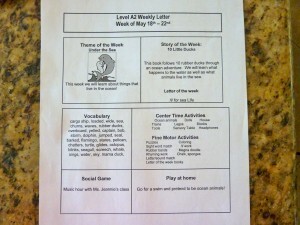 I’m sure that most of you get a letter at the beginning of the week from your child’s teacher explaining the themes, concepts and skills they are working on in class. 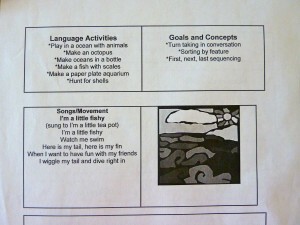 This is an important way for them to communicate with you what they are teaching your child in school. 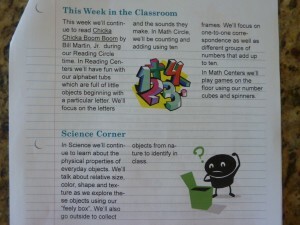 This letter is also a great way for you to get ideas for how to reinforce what they are doing in school at home. How can you do this? Through simple station activities as part of My Obstacle Course! My mission is to help parents “engage, encourage and empower” their children and what better way to do that than by reinforcing what they are working on in school in a fun way in order to strengthen the connections and knowledge. When I began doing this with Andrew, he would always look at me with one eyebrow up, like “How do you know about this stuff?” It helped me to see firsthand what vocabulary he understood, gave me specific examples of how he applied his knowledge and understanding and also gave him some extra time to build skills in a safe, loving environment – our home! Sample 1 is clearly an “Ocean” themed week, so I would treasure hunt for ocean related items to include. I would look for books, bath toys, kitchen items that could be used to encourage water play. I would also try to find pictures to go with the vocabulary words they were working on to help reinforce the word and the meaning. For Sample 2, I would include alphabet related activities to reinforce “Chicka-Chicka Boom Boom.” We have the book so I would use that as part of a read aloud or fluency station. For math, I would work do a matching station with a certain number of letters (to reinforce literacy) matched up with that number for one-one correspondence. I’d also play a game where we try to see how many different ways we can make a certain number (ex. for the number 10 – 1+9, 2+8, 3+7, 2×5 (two groups of five – never too early to begin working on multiplication 🙂 ), 11-1, etc.). Sample 3 is obviously working on building literacy skills so I would be utilizing word cards and letters to build these words (see ideas below). A chalkboard, white board or MagnaDoodle would be great for a station where they are writing their spelling words. Sample 4 screams out “Crawl and Match” for me. I would either write the compound word parts on separate cards or print them out a little larger and then cut them apart. I would place the beginning part of the word on one end of the carpet runner and the other half of the word on the other end of the runner so he could get the word part, crawl down and match it with the correct ending. 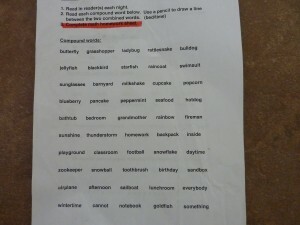 I would not do all of these as one activity – way too many, but may do two separate stations – the “Crawl and Match” and then maybe “Clothesline Clipping” the word parts together. Read by you to build listening stamina and skills like sitting in one place, staying quiet, listening for information, retelling, etc. Easily combined with comprehension questions – who? what? when? where? why? how? – which can be written on a beach ball to pass back and forth or written on cards for the child to flip. Either way helps to build question and answer skills. The public library is a great resource for themed books. Call and ask the librarians to pull books based on a certain theme for a certain reading level. I would give them a few days to pull them and if you don’t want to make lots of trips, I’d ask your child’s teacher what the themes/concepts will be for the next few weeks to save you time. Fluency is building reading skills through short passages so that it comes out smooth, clear, with expression and taking note of punctuation. If you start with material that is too difficult, it will be choppy as they work to decode the words. 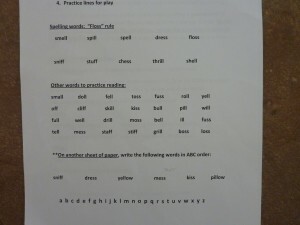 Start with passages that they can read easily, even if it is the ABC’s, so that they build their confidence.